The MSBA offers a variety of opportunities for individuals and businesses to effectively and efficiently market their services to our members. 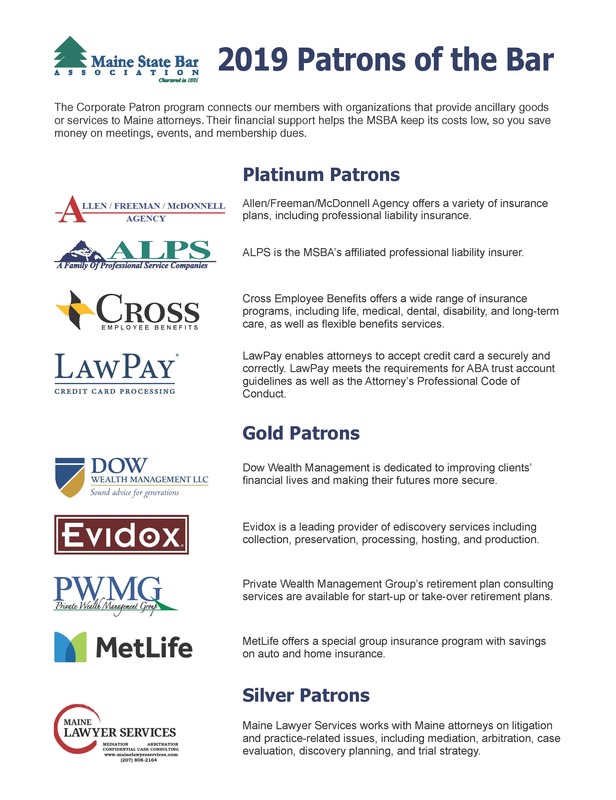 The Corporate Patron Program is designed to connect non-lawyers and organizations that provide ancillary goods or services to attorneys or the legal profession with our member attorneys. The program offers your organization the opportunity to increase awareness, build sales, and expand market share with our network of more than 3,100 attorneys who are licensed to practice in Maine. Patrons do not have the right to vote or hold office. While the fees are set by the MSBA Membership Committee, Patron status is not a membership category, and Patrons may not refer to themselves as members; rather, they are "Patrons of the Bar." Custom packages are available for organizations with specific preferences or interests. Please contact Heather Seavey at 622-7523 for more information. *The marketing credit may be applied to publication advertising, promotional pieces, or additional exhibit booths. **Published quarterly, the Maine Bar Journal is the flagship publication of the Maine State Bar Association, with a circulation of more than 3,100. ***The Supplement is MSBA’s monthly e-newsletter.